He is an excellent doctor w efficient staff. I went ahead and had the heel spur surgery and his work isamazing. I'm still under Dr's orders not to walk yet. Most of the time the wait time was fairly standard but my last follow up time was close to 2 hours before being seen. He stays busy. He is an excellent doctor w efficient staff. I went ahead and had the heel spur surgery and his work is amazing. I'm still under Dr's orders not to walk yet.Most of the time the wait time was fairly standard but my last follow up time was close to 2 hours before being seen. He stays busy. Great visit! Dr. Bass exceeded my expectations with his professionalism and knowledge. He took the time to thoroughly explaineverything to me. I look forward to recommending him and returning soon. Great visit! Dr. Bass exceeded my expectations with his professionalism and knowledge. He took the time to thoroughly explain everything to me. I look forward to recommending himand returning soon. 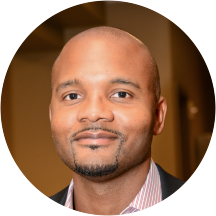 Javan Bass is a compassionate and dedicated podiatrist working in Lithonia, GA. He is a graduate of Temple University and completed an additional year of advanced trauma surgical training at Aria Health Hospital, which involved reconstruction of complex foot and leg fractures. Dr. Bass offers a full range of foot and ankle care from wart removal to complex surgeries. His areas of interest include diabetic limb salvage, pediatrics, trauma care, flatfoot reconstruction, infections, and sports medicine. In addition to his medical practice, Dr. Bass is an educator and author, working in the Podiatry Institute’s annual series gathering the latest advances in the field. He also trains residents at Dekalb Medical Center and the Atlanta Center for Foot & Ankle Surgery. He strives to stay abreast of the latest advances in order to provide the best patient care. Very professional & attentive to your needs! Dr. Bass is very friendly and interactive. I’m glad he is my doctor . Dr. Bass is the best! But be prepared for a very long wait time. Everything was great just a longer wait time than I expected. He understood exactly what was wrong with my feet. He was very detailed with explaining the process on recover of my issue. He has a great personality and demeanor. I would truly recommend this doctor. I travel over 30 miles tohave this doctor. He was work my time, gas and I am feeling better already. I will continue to see Dr Javan Bass, DPM for my condition. Great doctor with compassion for his patients. It was quick and effective! His entire staff is awesome!?? I would highly recommend him to others. He makes sure that I received the best quality care. He is so welcoming and always answer questions in a way that I understand. I am SOOO grateful for ZOCDOC. I chose the bestpodiatrist that a patient can ask for. I plan on being a patient for life! That he is just who I need to be treated by. His passion shows as soon as he steps in the room. He and his staff were awesome! He was very knowledgeable and I now have hope for my poor feet! He is simply wonderful! Great kindness and caring doctor. He really spent a lot of time with us to help answer our questions. Dr. Bass and his staff are very nice and friendly. The office is ran professionally and I was very pleased with his extensive knowledge and genuine approach to my treatment and well being! I highly recommend him. Dr. Bass was very professional. He took his time to explain things to me and answered all of my questions and concerns. He was great! Javan Bass, DPM was very professional; provided a lot of information and options for my son. My visit with dr java bass was a very good experience he explained my foot issue with me and what are my options for my foot condition.He was friendly and pleasant. I loved every moment! The office is clean, the staff is very friendly and Dr. Bass is very professional and very knowledgeable. He explained everything very well. I am very pleased. I thought he was very professional and knowledgeable . I enjoyed my appointment and it doesn't hurt that he's easy on the eyes!!! Office extremely busy, limited seating, but excellent doctor. Dr.Bass is a pleasure. He got straight to the point and assisted me throughout the entire process! I don't like his front office staff but his back office assistant is very nice. Dr. Bass is very informative and attentive to your concerns. He was patient and thorough. He was attentive. The visit resulted in some immediate relief of my pain. Very friendly staff, doctor was thorough, wait was long,about 90 minutes in waiting room. I will recommend. I really had a productive informative visit! Glad to have him treat me. The visit was a good one. However, they had no record of my appointment. ZocDoc needs to make sure that the doctors' offices are aware of appointments made on its site. The staff was very friendly from the front desk to the room where my son was diagnosed. Dr Javan Bass was very professional and thorough. He was very efficient with the diagnosis of my son's condition. I highly recommend this office. Javan Bass was very professional. the wait wasn't bad at all. I would recommend anyone who has any problems with their feet to go to him. My visit to Dr.Bass's office was great. I was immediately greeted when entering and my wait was at a minimum. The medical assistant was awesome as well as Dr. Bass. He's a great doctor. He was very thorough and detailed. He even took the time to break everything down. I'm happy to have found him. Very pleasant visit,he's a nice friendly and very knowledge Doctor, my Big toe that once was always in pain from ingrown toenail now feels .....Great!! !